NATC Rounds 9 & 10 were held in California this weekend. See the NATC Results page for the scores of all the classes and the year-end results. With a 1st place finish on Saturday, Cody Webb (Gas Gas) secured his first-ever national title. He’s pictured on the right with his father and minder, Kip Webb. See the full-sized photo at the bottom of the Lewisport USA home page. After finishing runner-up in the series standings for four straight years, Webb picked up his game in 2010, winning eight of the 10 rounds to easily capture the championship. At Donner, Webb handled the huge granite walls and drops with precision, topping three-time and defending Champ Patrick Smage by 26 points on Saturday and 38 on Sunday. See Cody Webb’s Facebook profile wall and this message thread on Trials Central for all the congratulatory messages. NATC Rounds 7 & 8 were held in Colorado this weekend. 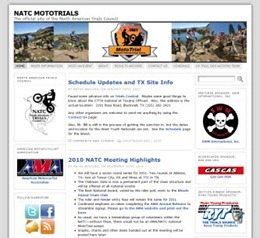 See the NATC Results page for the scores of all the classes. 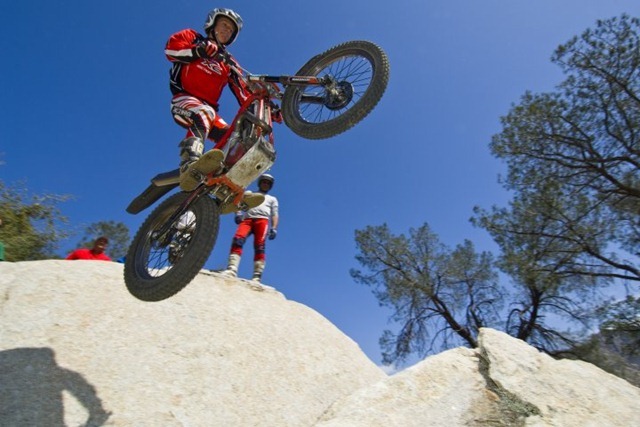 By taking first place both days in Colorado over the weekend, Cody Webb (GasGas) has all but clinched first place in the 2010 AMA/NATC National Championship Trials Series. With 6 wins (including one in Oklahoma, one in Rhode Island, and two in New York), Webb will likely have his first-ever National Championship next week in California, beating out four-time AMA/NATC National Trials Champion Pat Smage (Sherco). Dan Williams wrote in the Trials Central forum: "I calculate Cody only needs a fifth place (16 points) finish either day in California to clinch." NATC Rounds 5 & 6 were held in New York last weekend. And see Ron Commo’s post in the Trials Central forum for some details: Webb Dominates NY Nationals, USA Rounds 5 & 6.